Sub spends over a year at the bottom of the ocean! Sorry for the long thread title but have a look at this! I dropped by my local RSC today for a visit and to see if there were any pre-loved rolexes for sale when Steve said "Have a look at this!" 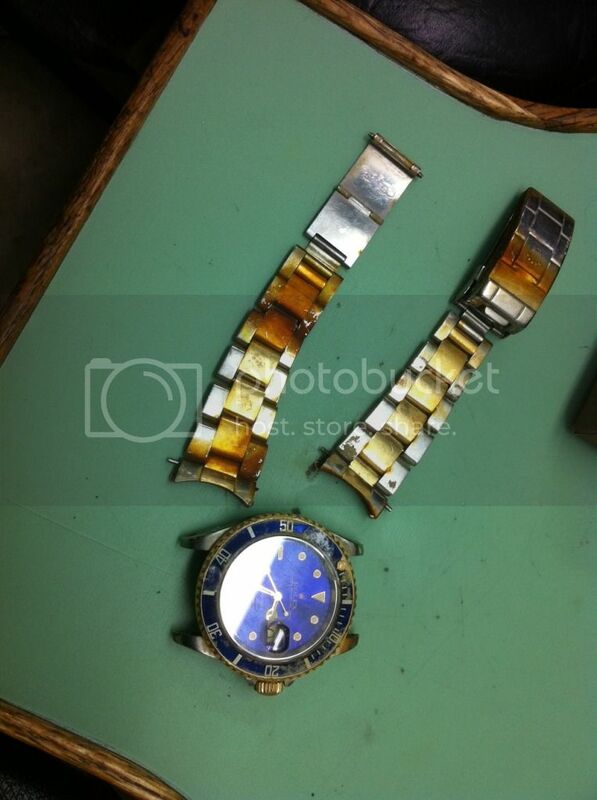 The owner was fishing on the west coast of British Columbia when the clasp of his Submariner hooked onto his fishing rod, broke a pin on the bracelet and fell overboard. His first reaction was to record the coordinates on his GPS so he knew within a few meters of the "Drop Zone"
It just so happened that not far from this particular location there was a dredging barge, that moves sediment from the oceans floor working on a regular basis, so he contacted them asking to search the area on occasion (at a cost of 85.00 per hour) to see if the watch could be found. For some extra incentive he offered 1000.00 cash if the watch was recovered. 14 months later guess what?? Found in over 100 meters of salt water and the cool part? look at the second hand in the pics below! After 40 winds the watch still works to spec! I would never believe it if I didn't see it with my own eyes and here it from my own RSC. The watch had a freakin barnicle growing on the bezel! How crazy is that?? It didn't happen without pics you say?? I am impressed. You should get someone to write an short article about this watch!! Apparently it will be in the local paper sometime maybe next week. wow that is amazing, who cares about how deep it goes, its about how LONG it can stay underwater! It looks like algae to me, and it'll come off. With a service and polishing, I'll bet you'd never know what happened to it. 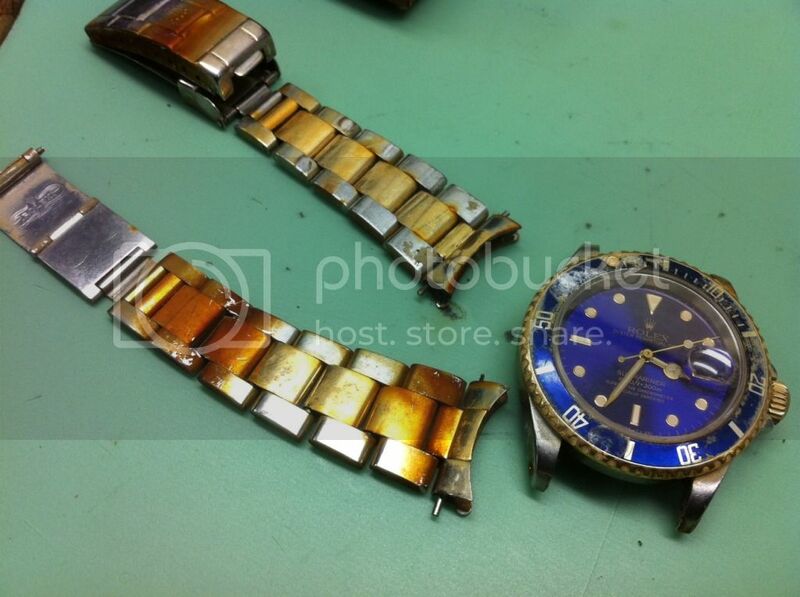 Always a good idea to insure your watches. Great story!! Interesting story, and one exceptionally lucky owner!! That is awesome. Will RSC take that? amazing! it will look like new after a spa treatment! The one that didn't get away, thanks for sharing. Well if any off you guys dive in the Red Sea there is a SD belonging to me somewhere in the blue just of the north pinnacle of the Elphinstone reef.It was lost around 12 years ago but depths off the reef go down to 1000m,but it was replaced by my dive insurance. Just imagine: the small wristwatch falls down to the bottom of the ocean.. Then after a few dozen hours, it stops, dead. The second hand, the cold second hand, stops. For months, in the cold dark water. It should never work again, and back to life! Wow. now this is the real SUBMARINEr! Excellent story! I would write a letter to Rolex if I was the owner congratulating them on a great product. Maybe they'll pick up the tab at RSC! A five minutes shower or a 1 year shower, what's the difference? I took a 30 minute bath last night, should I send Rolex a letter? Great story! almost a needle in a haystack! Simply amazing, thank you so much for posting. I wonder if Rolex is going to use this in an advertisement? They should! I'd like them to step up and offer a full service for this fellow. Does look like rust, but understandable after a year in salt water.